Valve Job Technical Comments will explain how valve jobs are done. There is no magic to a valve job. We will make some basic comments about valve work in these few photos. If you have questions, please call me. Ferrari in most cases says to replace the seat inserts or the entire cylinder head when doing a valve job. This is a little extreme, but we will tell you why they say that. As you can see in this photo, the valve seats, that is the contact area between the valve and the seat insert are at the top edge of the inserts. This is how Ferrari wants it. Ferrari says the top of the 45, that is the angle of the seat contact area, should be at the top of the insert and tangent to the chamber. When these heads are made, the seat inserts are installed and then the chambers are machined. After the Chambers are Machined, the Valve Job is Done. That is how they do it. When you do a “Valve Job”, You must Machine a New Contact area, this “Sinks” the Seats- you cant raise them. The next Valve Job Technical Comments Photo has more details. This vintage Maserati cylinder head shows an original combustion chamber. 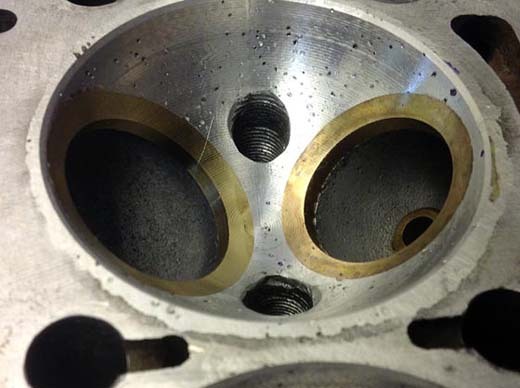 This is a typical basic race engine valve job. The angles may change, the basics do not. Study the photo until you understand the purpose of each angle. Usually the Outside Diameter (top of the seat) of the valve seat is .010 smaller than the diameter of the valve. Typical seat widths are .060 wide for the int.and .100 for the ex. The width of the valve seats will vary depending on application. When a shop “cuts the seats” they machine the 45 in the head to be concentric with the valve guide. The valve is also reground to provide a concentric sealing surface.There is more detail in the next valve job technical comments photo. When you cut the seat (insert in the head) the 45 gets wider, the o.d gets bigger and bottom of the 45 now is a smaller i.d.Next a 30? degree cutter is used to “top cut”or reduce the o. d. of the seat to .010 smaller then the valve. Then a 70 degree(bottom) cut is used to open the i.d at the bottom of the 45 and to get the correct seat width.Your new re seated valves are now lower in the head. 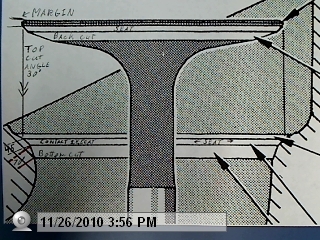 Typically you can lower or “sink” the valves up to .020 thousands of an inch without seeing a loss of power. When the valve is re cut, the margin is now narrower,and the seat wider- that is why a valve is “back cut”. The width of the seat on the valve is slightly wider then the width of the valve seat in the cylinder head. Please go to the next Valve Job Technical Comments Photo. 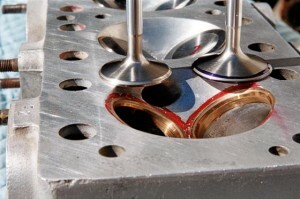 Sometimes larger valves can be installed to maintain the correct valve to seat relationship. Today most valve work is done with carbide cutters that are made with all the valve seat angles on them. A tool holds this cutter and is set to cut the seat at the correct diameter. Modern tooling makes it easy to keep all the valve heights the same. These cutters can be ordered in any combination and are about $100 each. We do valve jobs using modern tooling in our machining center. A problem with many of the old Ferrari’s is that as the valves are sunk in the head, the valve adjusters must be shortened to be able to set the lash. 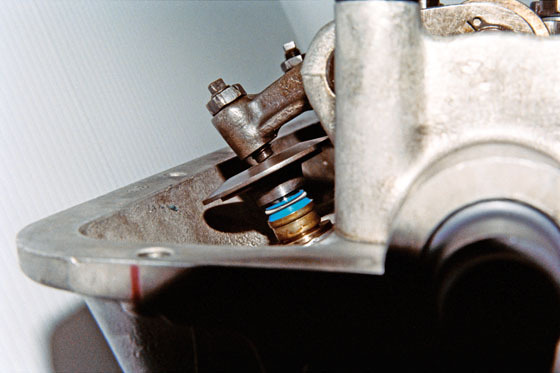 Shortening the valve adjuster may cause the spring retainer to hit the rocker arm, causing the retainer to fall off. With the cam at full lift one can see the adjuster is at a bad angle to the valve. This is the stock set up. While this adjuster is worn out the new ones are not much better. This poor geometry and small point of contact even with a low lift cam(9mm) and soft valve springs (175lbs) causes tremendous side loads on the valve guide, wearing them out much sooner than would be expected in an engine with better geometry. It is very difficult to replace valve guides and only lose .015 in valve seat height- Sometimes it can be done and the seat is only dropped .006-.007. In theory one should only lose .003- .004 in height, but that is not usually the reality. .